These days, all you really need to set up a home office is a laptop and a surface to put it on. But not every surface you can set your computer on can serve as a desk, and not all desks are suitable for use outside of a dedicated home office. 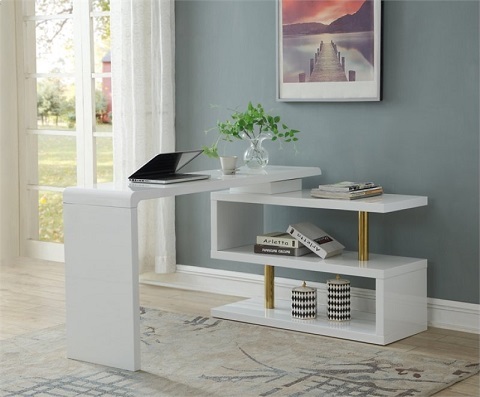 Multi-purpose desks offer the best of both worlds, giving you a setup that’s actually comfortable enough to sit and work at, but that makes sense for use in the public areas of your home, with built-in bookshelves for decoration, display, and storage. Leaving even a small office desk adrift in your living room can make your space feel a little bit awkward. Even if the public parts of the room and workspace are rarely used at the same time, having that reminder of the daily grind can be a real buzz-kill. One easy way to distract from the too-functional feeling of an office desk is to incorporate additional shelving – for books or other media, or even just as a decorative display. Ladder desks are among my favorite multi-function desks for this purpose, because they’re relatively narrow and have a slightly more playful (and less stuffy) feel to them than a conventional work desk. Better still, ladder desks blend in almost seamlessly with ladder-style bookshelves. 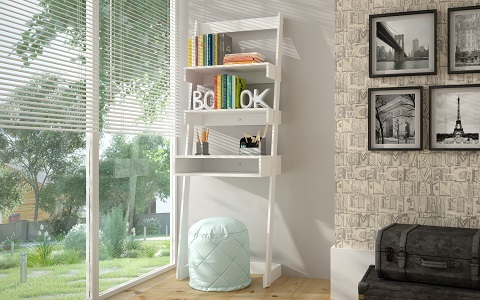 Regular bookshelves make poor work surfaces because they have both too little surface space to work comfortably on and no legroom to speak of, but the angled design of ladder style furniture lends itself well to little tweaks, like an elongated shelf with a keyboard caddy, and a few omitted shelves to give you space to sit and store a chair or stool. Having matching bookshelves not only gives you a whole lot more storage space, but also a little extra camouflage to make that desk feel more at home. You can also find small laptop desks that have bookshelves stuck to one side. 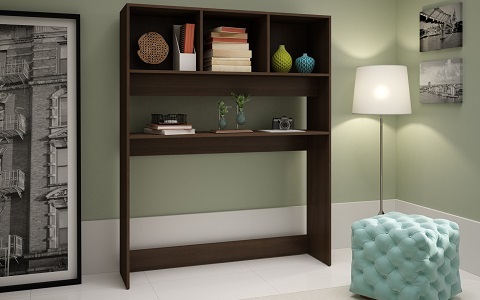 Rather than the surface of the desk serving as one of the “shelves,” these bookshelves sit kitty corner to a narrow desk surface, making these a good option for use as corner desks or – if you’re feeling a little daring – small desks that extend out into your living room. As with ladder desks, these blend well with a larger bank of bookshelves, but also work well on their own, adding a small homey touch to a desk that’s just big enough to house a basic home office setup. If you’re worried about a multi-purpose desk/bookshelf getting in the way – especially having the desk surface jutting out from the “front” of the bookshelf – look for models that have pivoting or folding desktops. Rather than having a fixed T- or L-shaped design, these desks are adjustable, able to be converted into a long side-by-side desk and bookshelf, an L-shaped corner desk, or folded down to be a perfectly average looking bookshelf. If you want an office desk that’s truly incognito, this is definitely the way to go – but make sure the desk you’re looking at can be moved on demand, rather than fixed into a certain position at installation. Hutch-style desks are maybe the most conspicuous of these incognito, multi-purpose office desks, but they’re a solid option if you need more than the bare minimum of desk space, particularly if you’re working with a desktop computer or a larger monitor or tablet. 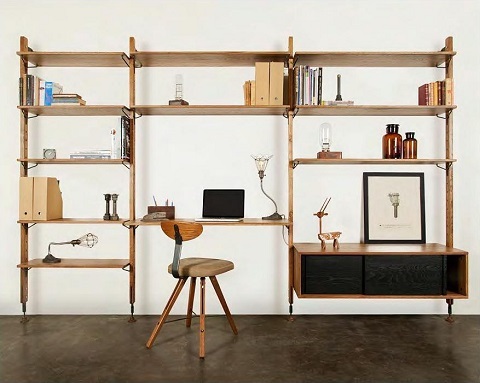 My favorites are part of modular sets that let you decorate the rest of your living space with coordinating shelves, cabinets, stands, and so on, and are essentially wide desk surfaces topped with one or more shelves. If you’re looking to upgrade to a standing desk, hutch-style desks are often designed with work surfaces that are either height-adjustable or designed to be used while standing. Admittedly these can look a little odd on their own (especially ones that forego having lower shelves), but you won’t have to worry about storing an office chair in your living room and, if experts are to be believed, working while standing is better for you anyway. 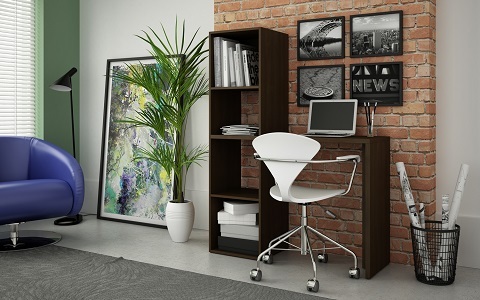 Having a home office in one of the public areas of your home doesn’t have to be an eyesore. Adding even a few extra books or decorative elements can make a bigger difference than you think, and if you spend some time looking, you can find desks that will really feel like a natural part of your living space. This entry was posted in Decorating Ideas and Tips, Furnishing Ideas and tagged bookshelf desks, compact home office desks, home office desks, home office furniture, ladder desks, laptop desks, standing desks.